1. Heat the oven to 220°C, gas mark 7. Cut the sweet potatoes into thin wedges, place on a baking tray, drizzle and toss in 2 tsp oil. Season and bake for 30 minutes, turning once. 2. Meanwhile, in a food processor, whizz the bread to coarse crumbs. Add 4 chopped salad onions, the beans, egg and chipotle paste, then pulse until coarsely chopped. 3. Heat the remaining oil in a frying pan. Shape the mixture into 4 patties about 2cm thick. Add to the pan and cook over a medium heat for 5 minutes each side until lightly browned. Transfer to the sweet potato tray and cook for 5 minutes in the oven. 4. Slice the last salad onion and mix with the peppers, lime zest and juice. 5. Serve the burgers in ‘cups’ made from 2 lettuce leaves, with the sides. 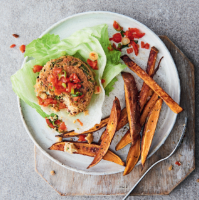 Cook’s tip Double the recipe and wrap the uncooked bean burgers in clingfilm, then open-freeze until solid and stack in a freezer box until needed.